Small group adventure, maximum 12 people, on board 4x4 cars (maximum 3 passengers per car). 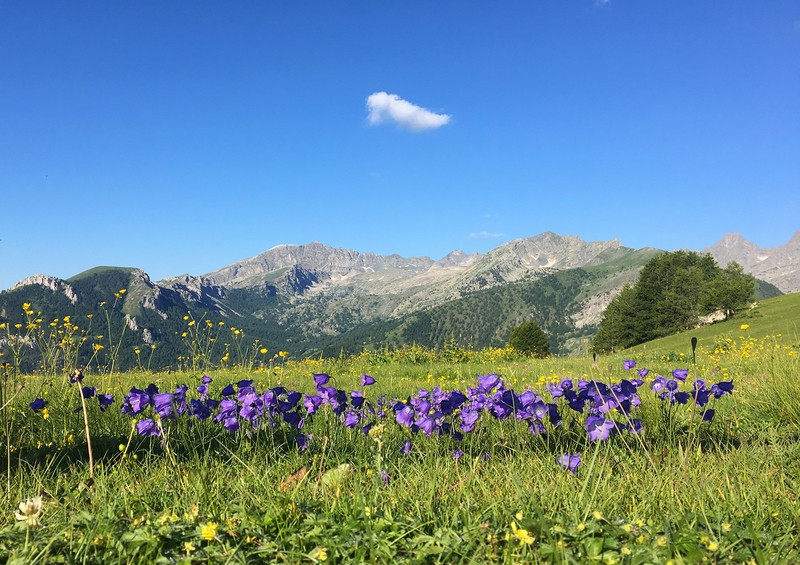 Located on the border between Italy and France, the wild and untouched Cottian and Maritime Alps enshrine natural, cultural and historical treasures of great interest. During this small expedition, using old mule tracks and military roads, we will drive the ancient Salt Routes between France and Italy, we will visit the Vallee des Merveilles with its prehistoric rock carvings, the massive fortifications wanted by the Savoia to defend Piedmont and the Alpi Marittime Natural Park. The beautiful early summer blossoming of the high mountains will be with us during our adventure over 2000 meters of altitude, where the larch forest leave space to the grazing areas. Over 3000 species of flowers can be found, including many endemics. 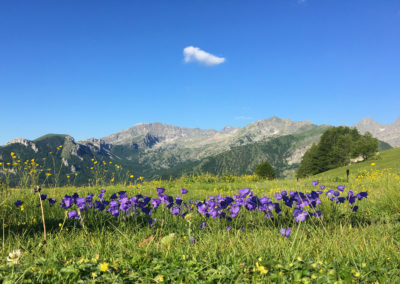 We will look for wildlife: marmot, weasel, chamois, eagle and vulture live here; also visit small traditional villages, some of which hide precious secrets such as the frescoes of the Flemish painter Hans Clemer, and enjoy the wonderful cuisine of the Provencal Alps. All accompanied by two expert guides, Toni Caranta and Piero Bosco. Meeting in Cuneo at the hotel for the check-in. In the afternoon if interested it is possible visit the “Alpini” Museum, free time for shopping in the old town. Dinner with traditional menu at a typical restaurant. Overnight at Hotel Royal Superga ***. After breakfast we will leave the city on board our 4x4 (maximum 3 passengers per car) heading towards the Maritime Alps, through the Vermenagna Valley we will reach France and the Vallee des Merveilles, located in the heart of the Mercantour National Park is one of the most important petroglyphs sites in Europe. A collection of prehistoric art shaped by ancient glaciers that retreat 10 000 years ago, have left behind them finely polished rocks, a necklace of picturesque lakes but above all the history of our ancestors dating back to 3000 A.C. The mystery of tens of thousands of rock engravings in the open air, a place that takes us back in time to our origins! Discovered in the late XIX century, the engravings are on the rocks and include horned figures (cattle), weapons (daggers, spears, axes, etc. ), anthropomorphic and geometric figures (spirals …). The interpretation is difficult, but generally refers to religious concerns. Most of these incisions are located around Mount Bego, which suggests that this mountain was sacred. At the end of the visit we will take a dirt military road facing the spectacular rocky shape of the Rocca dell’Abisso, which from the Bassa di Peirafica will lead us to the Tenda’s Pass. 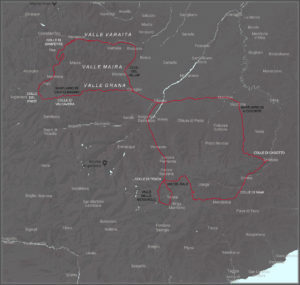 The drive will lead us to some of the military forts built by the Savoia in the Roia Valley in the late XIX century to defend the borders of the Kingdom of Italy. Late in the afternoon we will reach Panice Soprana, a small settlement located in the municipality of Limone Piemonte, where we will enjoy a typical dinner and spend the night in a modern wooden chalet with Spa at about 1600 meters above the sea level. Overnight at Chalet Morel ****. In the heart of the Ligurian Alps, along the ridge that separates the plain from the sea, runs the Alta Via del Sale (High Salt Route), so named after the precious mineral transported by mule for centuries through these mountains. The Limone-Monesi route is a magnificent itinerary that winds between 1800 and 2100 meters above sea level on an ancient dirt road. This entirely unpaved road has a total length of 39 km and is open for the transit of a small amount of cars in the summer and autumn months upon payment of a toll. The route passes through enchanting places such as the picturesque area of ​​the Carsene with its lunar landscapes, the pristine environments of the Protected Areas of the Maritime Alps and the Ligurian Alps Park characterized by a rich biodiversity ranging from the Marmots to the Chamois, the wonderful Bosco delle Navette, a fairy tale forest and some military fortifications of the late XIX century. Today’s emotions will not end with the arrival in the Liguria village of Monesi, from there we will return to Piedmont overcoming first the Nava’s Pass entering the Tanaro Valley and then the Pass of Casotto that will take us to the homonymous valley where we will stop for a short time to see from the outside the Castle of Casotto, hunting residence of the king Vittorio Emanuele II. We will then continue our drive to the Vicoforte Sanctuary where we will be admired by the majesty of the largest elliptical dome in the world and where we will be able to visit the tomb of king’s Carlo Emanuele I and Vittorio Emanuele III. We will return to Cuneo in the evening. The first goal of the day will be the Ciciu from Villar Nature Reserve located near the valley outlet of the river Maira, where curious and picturesque natural stone monuments known as Ciciu del Villar stand, terms that in the local idiom mean puppets of Villar or stone puppets. These natural sculptures are comparable to rocky mushrooms, composed of a stem on which rests a hat made of a boulder of gneiss. Left the Ciciu, after a few kilometers we will enter the Varaita Valley and we will drive up to Sampeyre, here we will leave the road going to France through the Agnello Pass and take a narrow and steep asphalt road built by the Piedmontese army in the XVIII century. We will gain 1,300 meters in altitude driving through pristine forests of larches and typical mountain villages, and reach the Colle di Sampeyre Pass, located at 2284 meters above sea level and after it the Maira Valley. 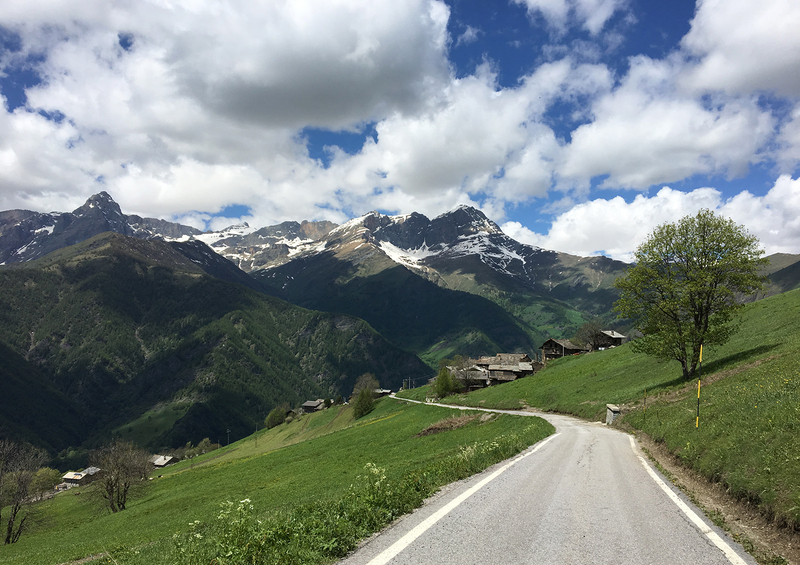 The view from the pass is spectacular, on clear days the looming shape of the Monviso seems there close at hand, the blooming is beautiful here and you will walk on a carpet of Rhododendrons, the Marmots whistle in the meadows and just near the road often the Weasels appear. After enjoying a picnic in the meadows we will begin our descent towards Elva, one of the smallest municipalities in Italy with less than 100 residents. This tiny, isolated village in the mountains has an intriguing and unexpected history and holds true jewels. We will visit the Parish Church with the XV century frescoes by the Flemish painter Hans Clemer and the Museum of the Cavié, the hair collectors and skilled creators of wigs that produced their works for the upper middle classes of France, England and America in the XIX century. Back at about 2000 meters through spectacular views and small villages perched on the cliffs we will continue our descent towards the valley bottom, visiting the Church of San Peyre di Stroppo built on the XIII century. We will reach in the evening Marmora, another small characteristic village of the Cottian Alps where we will enjoy a typical dinner and spend the night in a cosy and recently renovated traditional inn. Overnight at Locanda Occitana Lou Pitavin. An adventurous morning await us today, on board our 4x4 cars we will drive the narrow and steep road that trough the Preit Valley, surrounded by wilder vistas, the view of the imposing Rocca La Meja Mount is spectacular, reach the Preit Pass at 2083 meters above sea level. Here the asphalt leaves space to the dirt road that will take us to the Gardetta plateau, Italian Geological Heritage Site and strategic point of the military defensive system wanted by Mussolini in defense of the national borders called Vallo Alpino of which we will find numerous examples. 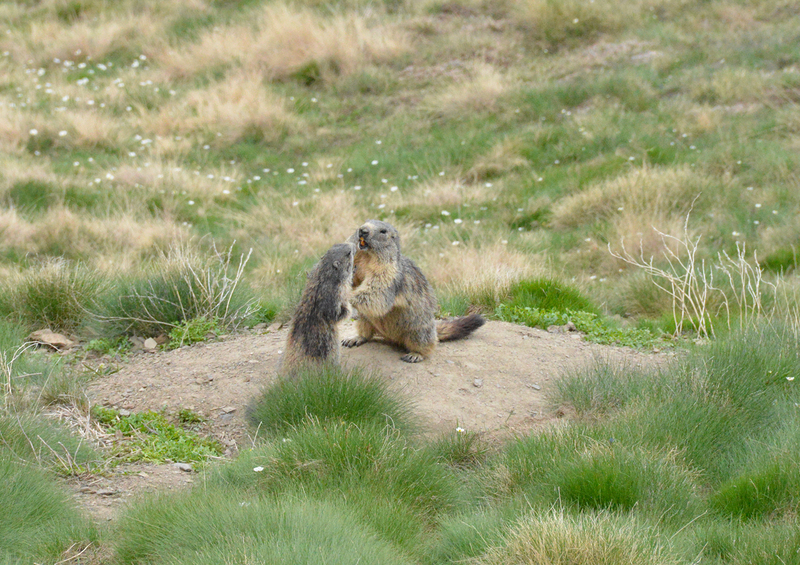 The scenery is great, the old military road crosses flowery meadows where the Marmots often peek out of their burrows. 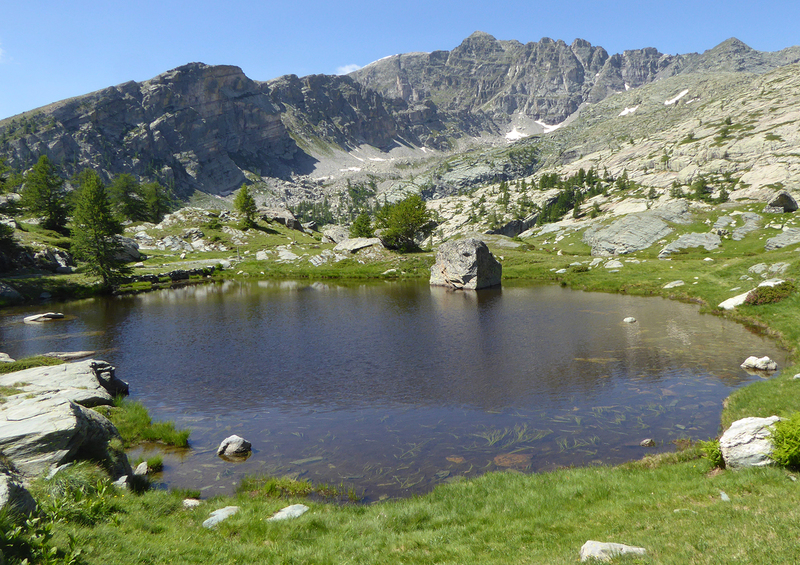 The plateau of the Gardetta will make us experience the high mountains in all its most spectacular aspects, here the altitude is felt all right, the sensations are almost aerial. Leaving the plateau through the Pass of Valcavera and back on the asphalt we will climb again for a couple of kilometers until we reach the Fauniera Pass that with its 2480 meters above sea level is the highest point reached by our adventure. From here we will descend to Grana Valley where we will visit the Sanctuary of San Magno, one of the most important places of worship in the Cuneo valleys and then return to Cuneo. After breakfast our adventure will come to an end. * SOME OF THE ROADS INDICATED IN THE ITINERARY CROSS WILD TERRITORIES THEREFORE MAY BE SUBJECT TO UNEXPECTED CLOSURES DUE TO BAD WEATHER OR LAND SLIDES, IN SUCH CASES AN ALTERNATIVE ROUTE WILL BE PROPOSED. – Double room accommodation breakfast included. – 5 typical dinners and 4 pic-nic lunches. – Travel expenses to reach Cuneo.